The observation began at dusk, during very poor lighting (i.e., blurry photos), with a 1.5 year old male toying with what looked like a large dead rat. Indeed it was a dead rat, but when I examined it later, it turned out to be a very small one. For some reason, next to the coyote it looked big. Both rat and coyote were smaller than I had projected from the distance. I did what many people do: I mistakenly had judged a coyote’s size based on something else nearby and the setting — and judged the coyote bigger than it really was. Many people tell me thy just saw a “very big” coyote: 50 or 60 pounds. Actually, Western Coyotes don’t come that big. They weigh 30-35 pounds and in the winter have 3″-4″ fluffy fur which makes them look larger than they are. The coyote toyed with the dead rat: he tossed it, caught it, twirled with it, practiced pouncing on it, jumped for it. After a short time, maybe only 3 minutes or so, he walked off with it, searched for an appropriate spot to hide it. He found the spot, dug a little depression, placed the rat in that depression, and then covered it all up, using his snout to push leaves, dirt and debris over the burial site. He looked around — the coast looked clear — so he walked away. He hadn’t bothered looking around in back of himself WHILE he was digging the depression and burying the rat — maybe he should have? Not far off, and unbeknownst to that coyote, Little 7-month old Brother observed Big Brother’s every move — it was year-and-a-half-year-old Big Brother who had buried the rat: to be used later either for play or for eating. As soon as Big Brother was out of sight, Little Brother headed directly over to the burial site at a trot. He sniffed around and found what he was looking for and dug it up. He did this secretly, sneaking over there only after the first coyote had left. He looked around to make sure he wasn’t being watched. And then he stole the rat — the bandit. Ahhh, now the rat was his. He grabbed it and began to play happily with it: same rat, but a different coyote: tossing it, catching it, twirling with it. After he had enough playtime, he would bury it in a different place where only HE would be able to find it. He entered the forest with the rat. I heard sticks crackling and leaves rustling. When I was able to locate him, he still had the rat in his mouth: the forest, apparently, was not a great place to cache the rat. As he left the forest grove, rat in mouth, sirens began to blare, and other family members who were close by began yipping along, joining-in one at a time. Coyotes love their yipping sessions — it’s lots of fun for them and definitely an emblem of their community/family spirit. But what do you do if you have a prized rat in your mouth WHEN sirens sound? Do you continue what you are doing, or join the chorus, or . . . both?! Find out in this video below! The coyote was definitely conflicted about his priorities. During the course of the video, his priorities shift from the rat, to both the rat AND yipping, to yipping, back to the rat and burying it (going so far as to half-heartedly dig a depression, becoming distracted again and then covering up the depression without having placed the rat in there), and then sitting, facing his nearby yipping family before heading off to physically join them. 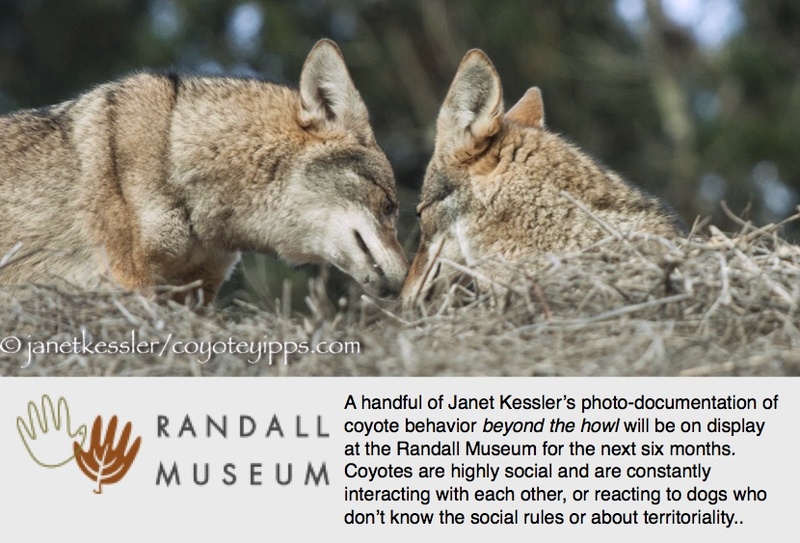 The rat was abandoned in favor of family activities: social life and family interactions are of utmost important to coyotes, and, actually, it’s what they live for. The next day the rat was not there. It had been taken, but I wonder who ended up with it, or where it might be buried? That is sooo funny Janet. They look so cute with their little prizes. Hi Charles! Yes, it was very funny — reputation confirming! I don’t know if this was one of those “oneupmanship” contests with a rival sibling, or if the second coyote really just wanted that rat, or if it’s simply a hunting technique. I’ve seen coyotes watch dogs dig holes, and when the dog leaves, the coyote hurries over to see what it is the dog was digging and to see if its luck might be better than the dog’s: they’re opportunistic after all! I just love your videos! This morning I heard a yipping that I had not heard before. It was a bit like the distant one here. We are in the Saratoga-Santa Cruz Mountains and hear a lot of yipping. For some instinctual reason our smallish dogs feel the need to respond. Thank you for all that you do here.